Daniel Bernoulli came from a famous Swiss family of mathematicians and eventually became a pioneer in hydrodynamics and the kinetic theory of gases. He was born on February 8, 1700, in Groningen in the Netherlands, where his father held the academic post at the university. His father, Johann Bernoulli, his uncle, Jacob Bernoulli and his older brother, Nicolous (II) were also famous mathematicians. When Daniel was five years old, his family moved back to Basel (which was their native city), where his father ended up taking over Jacob’s old chair, which was left vacant after his Uncle Jacob’s death. Daniel had one elder brother, Nicolaus (II), and one younger brother, Johann (II). 1n 1713, when Daniel was 13 years old, he went to Basel University to study philosophy and logic, in line with his father’s wishes. He completed his bachelor’s degree in 1715 and went on to obtain his master’s degree in 1716. Johann pushed his son in the direction of becoming a merchant, as there was no money in the career of mathematics. Daniel resisted and his father relented at his decision. Realizing his son’s keen interest and inherited family talent, Johann began to tutor Daniel in the methods of calculus and his theories of kinetic energy. Daniel studied philosophy, medicine, and logic from different universities of Heidelberg, Basel, and Strasbourg. Just like his father, Daniel wanted an academic career in the university, but he did not succeed. As Daniel was unable to get an academic post, he went to the city of Venice to study practical medicine. While in Venice, his first work on Mathematical Exercises was published in 1724. The work brought him recognition all across the Europe and in 1732, Bernoulli was offered a position in Basel to teach botany and anatomy. Bernoulli’s chief work was in Hydrodynamique, published in 1738. This work was published in Strasbourg. It laid out the principles of fluid dynamics, which consisted of a treatise on differential equations related to the physics of flowing water (fluid dynamics). It developed the relationship between fluid velocity, pressure and density. Bernoulli’s theorem is the basis of aircraft design. This principle on stationary flow remains the general principle of aerodynamics and forms the basis of the modern explanation of lift. In 1734, both Daniel and his father were declared joint winners of the Grand Prize of the Paris Academy for their work on planetary orbits. This affected his relationship with his father who felt that he should have received the prize alone. 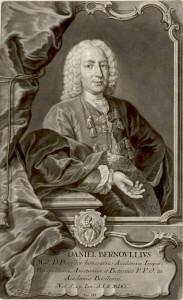 Daniel Bernoulli did produce several other excellent scientific works during his job in Basel. He won several awards for his contribution to laws and theories of physics and mathematics. In 1737, he won for work on the best shape for a ship’s anchor. In 1740, he won for his work on essays on magnetism. Other awards include one in 1747 for a method to determine time at sea and in 1753 for the effects of forces on ships. Between 1725 and 1749, he won 10 prizes from the Paris Academy for his work in astronomy, tides, magnetism and ocean currents.